ORTELIUS - Lutzenburgensis Ducatus veriss descript. ORTELIUS, A. - Lutzenburgensis Ducatus veriss descript. Lutzenburgensis Ducatus veriss descript. - ORTELIUS, A. Title : Lutzenburgensis Ducatus veriss descript.. Size : 14.4 x 19.3 inches. / 36.5 x 49.1 cm. Description :Prepared by Jacob Surhon who made a manuscript map of Luxembourg for which he received 500 Livres from Charles V in 1551. For security reasons the map was not published. 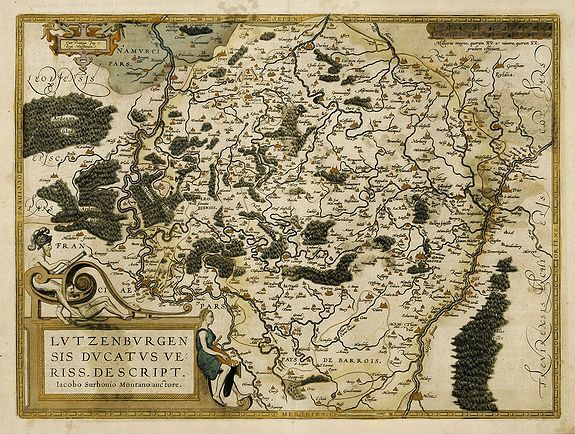 Only in 1579, when Antwerp was independent for a short time, Ortelius used the map for publication in his atlas. Very attractive original colours from a rare Spanish text edition. Condition : Some minor marginal discolouration of paper. From a rare Spanish text edition.